THAT GIRL loves. She takes a stand for loving herself and loving on others. She brings out the best in people and genuinely cares. THAT GIRL supports. She lifts people up and inspires others to do the same. She gets that hurt people hurt people and shows compassion even to those who might not show it back. She celebrates girls and sees them for the beauties that they are. THAT GIRL gives back. She shares her love and gives back to her community any chance she gets. She's leaving this world better than she found it. THAT GIRL speaks her truth. She's brave enough to be vulnerable. She speaks honestly and openly so she can be seen for who she truly is. She knows by doing so, she gives others permission to do the same - AMAZING. My local chapter at the University of Arizona was started last August with only five girls originally. By April 2017, there were about 15 people coming to meetings regularly. This semester, we had non-binary people and men start coming to meetings, so our chapter leader decided to move away from the name of I Am That Girl and become I Am That Person to be more inclusive. Because of this, we've been able to discuss cisnormativity and how we are able to help dismantle it. One meeting we had focused on uplifting each other, so we held a program where everyone sat in a circle and just told another person how amazing and inspiring they are with so much vulnerability that I'm pretty sure everyone cried at one point. It was such a beautiful thing to be a part of; there was just so much positivity flowing around the room and I want everyone to feel the way I did during that program. There are new people almost every meeting, and they were getting and giving complements like they had been there forever. And honestly, this is how most meetings feel. I go in the room and feel completely loved and welcome, which is hard to find when you go to a large university. We just had our first annual IATP self-love camping retreat about a month ago. The chapter went up to Mount Lemmon and stayed overnight to help everyone destress before finals and work on self-love. We sat around the campfire practicing vulnerability, and I have never known anywhere else where being vulnerable is your best self. This club has truly helped me learn about myself and has helped my self-esteem so much. I'm much more aware of my thoughts, I'm much more positive towards other women and I'm much more understanding of people and situations that I might not have known before. 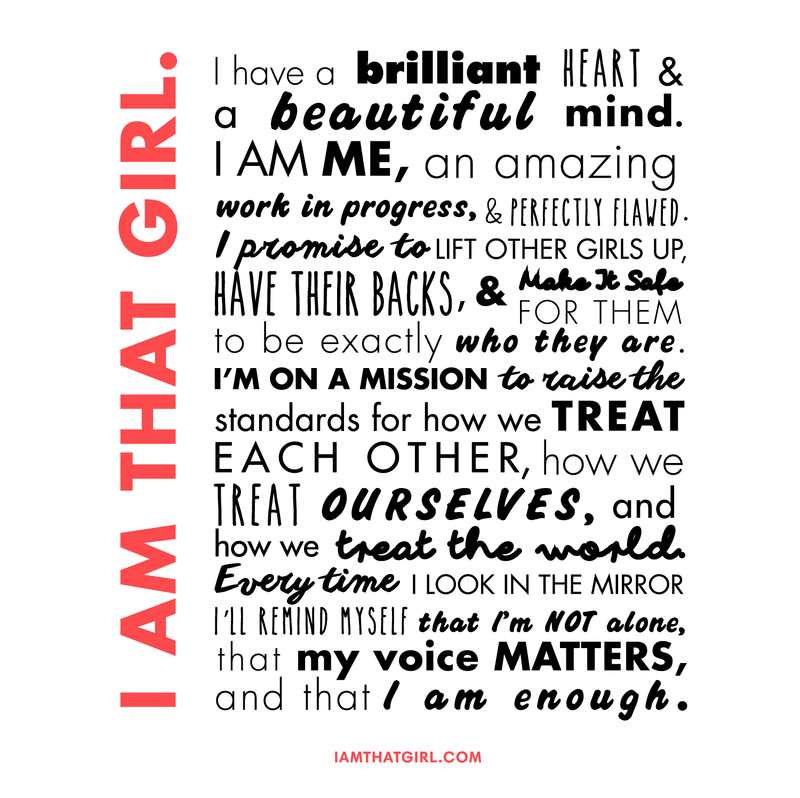 If you feel like this organization is the place for you, go to their website at iamthatgirl.com and see if there's a chapter near you! If there isn't, you can do what my chapter leader did and form your own chapter. It's a fantastic organization, and I hope more women are able to find a safe space to grow their self-esteem and self-love through this organization. Mira is an aspiring granny and speech pathologist. You can always find her embroidering or knitting in her off time from studying at the University of Arizona. She drinks Diet Coke religiously while binge-watching 30 Rock or binge-listening My Favorite Murder.